Club El Beril resort invites you to enjoy lazy days by the pool or relax in the comfort of your elegant, spacious accommodation. The resort also features a children's pool and car rental services for your convenience. The resort is your private oasis nestled away on beautiful, well-maintained grounds with panoramic views of the surrounding area, set in the pretty town of Adeje. 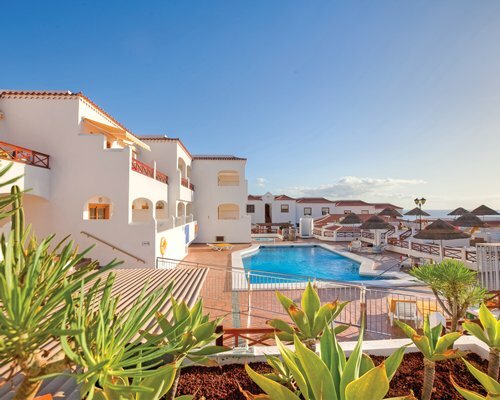 Lively Playa de las Americas and Los Cristianos are a short bus ride away, with Siam Park also nearby. Enjoy the luxury and pleasure of spacious comfort of studio, one bedroom and two bedroom villa apartments that can sleep up to six people. 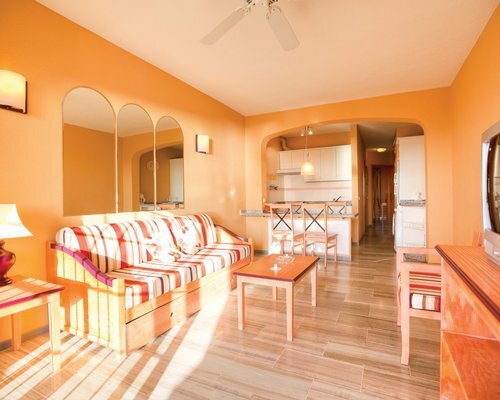 Bedrooms and living areas are roomy and elegantly furnished. All units have ceiling fans in the living room telephone, satellite TV, VCR, and either a mini-kitchen or full kitchen, with oven and full-sized refrigerator. And of course, the staff at Club El Beril is eager to please and make your visit one you will want to make again and again. Club El Beril is peacefully situated to the north of Playa de las Americas just steps away from the magnificent beach, impressive shops, exciting restaurants and island nightlife. Close by is everything you need for the vacation of a lifetime. While away the day on the beach, discover the wonders of the deep scuba diving and snorkeling, play world-class golf courses, sail around the islands, go horseback riding, even try your luck at the island's casino. .
BY AIR: Nearest Airport: Reina Sofia, Tenerife South 28kms; BY ROAD: From the airport follow the signs for Los Cristianos then Adeje Carry on along the motorway , take exit 78 towards La Caleta This road takes you down towards the sea and as the road bends round to the right, take the turn on the left hand side. It is about 2 Kms from the main road to the Resort. ( There is an airport in the north of the island, which is approximately 90 Km to the Resort).